Made of strong, sturdy timber, swing frames stand the test of time and kids still love them today. Using their arms and legs to build momentum, they can race to see who can get the highest. As well as all this fun, there is a large variety of swing seats to choose from. There is something for everyone with this classic playground activity. Play towers are a centrepiece for playgrounds. This is where you can include some of the most fun play equipment. Slides and Swings, as well as Climbing Walls and Cargo Nets, are just to name a few of the many possibilities available here. Set free the imagination of children with these action packed towers, suitable for any commercial play areas. Expand a child’s area of play with a multi-platform climbing frame experience. Opening up the space they have to run around and engage with others. With a variety of climbing, sliding, and swinging activities, there is something for everyone. Increase their scope of fun with these thrilling platform structures, great for children of any age or size. What could be more exciting than flying across the entire length of a playground? 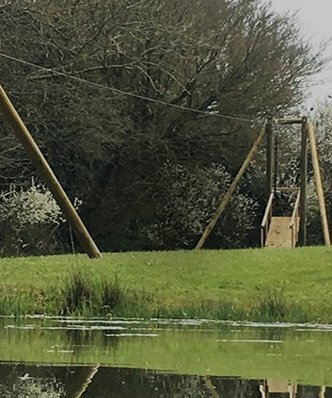 Taking in the views around, a zip wire can be one of the most thrilling activities we have to offer. With diversity from tree to tower, it is always ready to fit in any space. They are a sure-fire way of getting everyone into outdoor play, with this adrenaline pumping activity. Grass mats are often the easiest way to cover a small area. They provide cushioning and protection for the ground. Weather resistance and zero maintenance properties create hassle-free installation and are a great low-cost solution. You can buy them at the same time as ordering your climbing frame or tree house and we’ll be able to install them for you. 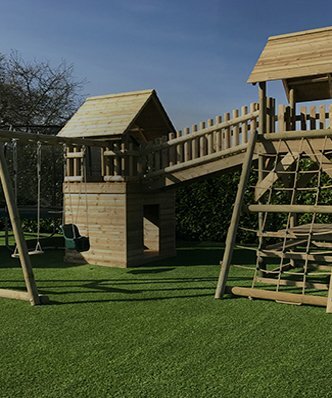 Made from recycled industrial tyres, Play Bark is great for giving an extra padded landing, but also looks wonderful in any play area. As the Play Bark is loose, it will need a wood board retaining edge to keep it in place. For a medium cost surface, you have one of the best lasting and softest materials for your child to fall on to, it’s worth the extra pennies! Wet pour is a great surfacing for a number of different reasons. The top layer takes the usual scuffs and wear from children and the second layer is the impact absorbing one. Great for taking the impact of many children. Wet Pour does come at a high cost. But the impact absorbent properties make it worthwhile when you see children playing. Astroturf is a good option to combine durability with the organic feel of grass. It has all-season consistency and has next-to-no maintenance. As well as being extremely shock absorbent, which great for falls from heights. It does come at a high cost. But it is well worth it, for a surfacing that both protects and has a freshly cut grass appearance. These obstacle course are suitable for gardens and playgrounds. They also offer a full-on play trail challenge for kids of all sizes. There is a great scope of play and sense of adventure for anyone who decided to tackle these head on. We can make these anyway you want us to and we can put together the perfect balance and climbing challenge your children need. Get from one end of the crossing to the other in any way possible – just don’t fall to the ground. Choose from your favourite raised crossings: ropes, tyres, netting mesh. Or you can have more than one to keep the kids off their toes. Great for creative play, balance, strength, and teamwork. Any combination is a fantastic way of testing your kids key skills. Make the kids work for their lunch, with our varied collection of scramble bridges. Go for all wood sides, or up the stake by adding a net to one or both of the sides. Or add net to both sides, it’s great for testing their hand-eye coordination. The race is on to see who can get to the top of the bridge and declare himself ‘King of the Castle’ and see who dares to join them. With the amount of variation between what kids like, it’s only reasonable that we have a wide selection of accessories to choose from. From sand pits to tube slides, there really is something for everyone. Or if you are thinking of something a little outside of the box, we are open to your ideas! We will always do our best to fulfil these dreams for you. 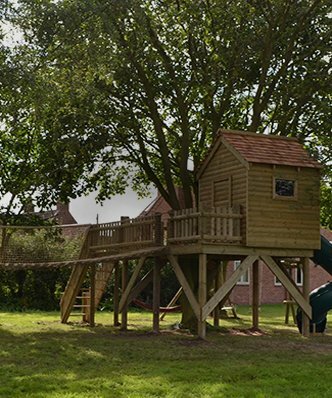 Whilst many of our build are for homes, we also build commercial climbing frames and tree houses for clients across England and Wales. 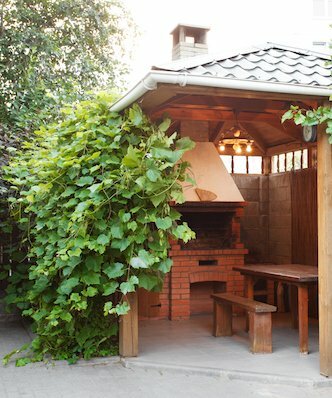 Our skill with wood knows no limits, other than the boundaries of your property and budget, of course. Many commercial builds require groundworks to ensure safety of the children on the site. Therefore we have detailed the groundwork options for climbing frame installations at schools and other commercial sites. On this website, we can adjust almost every product you can see, to suit commercial clients. Some are easy, some are more significant. So, when you browse our website we offer these two descriptions to help you understand the difference. We work hard to ensure that the detail of every build matches your exact requirements. These are climbing frame builds suitable both in layout and structure, with a few amendments, for a school or council. We may need to change some of the detailing. Perhaps thickness or type of timber, but these are mainly cosmetic requirements. It is normal for the cost to be greater, but not significantly so (within about 20% of the private build price). And the time to install will remain similar. These are tree house builds which need much more work to conform. For these builds it is likely that some of the features do not conform, even platform heights, or angles of walkways. It does not mean that the entire structure is not workable, but does mean that the final design will be substantially different to what is seen. 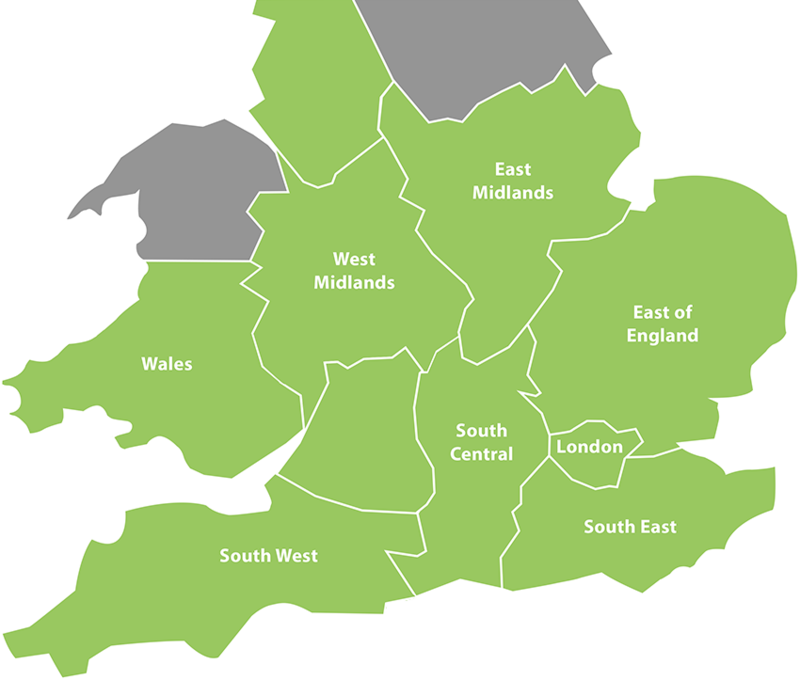 Therefore if you would like to adapt one of these builds to suit your requirements, then it is best to call us. Simply contact the team on 01962 600 626 to discuss your requirements with us and we will shape the right solution for you. For all commercial play equipment builds, we ensure that everything is specified to be approved for BS EN 1176. Where an outdoor adventure play installation will be used for a commercial setting, we design it to pass all necessary safety guidelines.